August | 2016 | Peroglyfer – Machine Learning changes math. Math changes everything. An example of set generation could be this idea. I will take two inventions that has good performance but low resemblance to each other. I choose the mirror and a wet cloth. A mirror surface is good at protecting you from heat but so is also water evaporating from a wet cloth. So why not combine those two things into inspiration for a new invention. I think the evapomirror could be used for cooling food. The idea is simple. When you take photos you almost always want to take with the highest resolution. Because you can not retake the photo. Then there is a problem. Since I think the standard for the highest resolution is a 4:3 box. For my phone its 2592×1944 = 4*648 x 3*648 or a 4:3 ratio . But the screen has a resolution that is 16:9 in resolution. 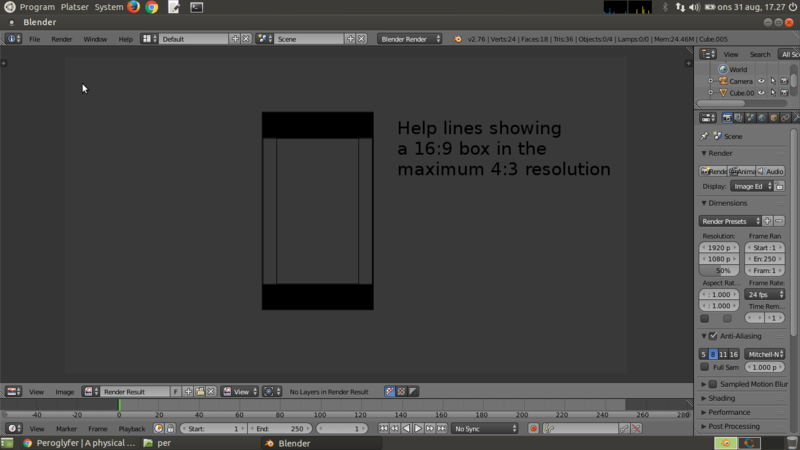 Then the idea is to have help lines showing a 16:9 box in the phone camera application. You then aim so that the important stuff is in the 16:9 box. Even if the photo will be a 4:3 box. Here the idea is to implement automatic crop and store two photos. One with the 4:3 resolution which can be printed on paper and a 16:9 resolution perfect for viewing on the TV or phone. Perhaps the meta data about the position of the 16:9 box could be stored in the larger 4:3 photo. But when viewing on the TV or the phone it automatically crops the image to the right position. Maybe a default position like in my screen shot could be used. Equal cut on one side as the other. Idea – Double Resolutions For The Smartphone Camera App. The important stuff is in the 16:9 box. The inner box is the 16:9 box of help lines. Then the 4:3 box. The actual photo. This is all wrapped up in the phone screen. 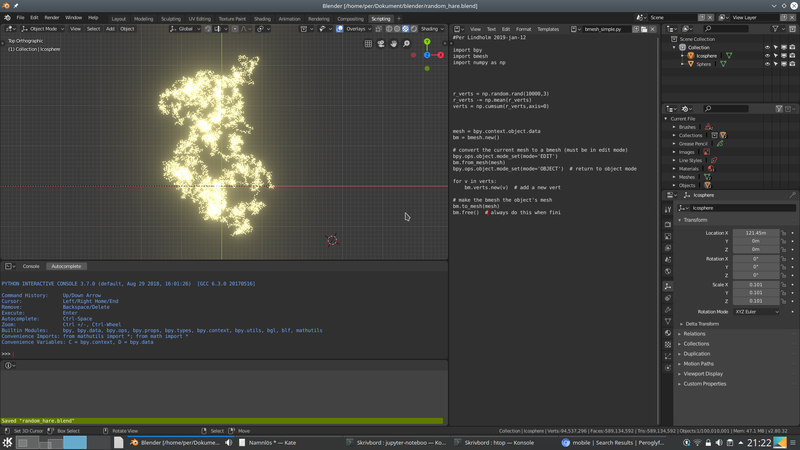 Blender 3D which I used for this is an excellent program on Linux for testing ideas. The idea is simple. We have all seen image recognition. Recognition of different things like faces, animals and things. I have a feeling that recognition by machine learning is the basis of many things like set generation. The idea is that you can’t generate a new set only by optimization. That is. If you optimize a bicycle for instance you won’t get to a car. Optimization is limited. What you need is some new information. Here is where recognition by machine learning comes in. Say you have a new set of 100 optimized machines and machine learning software that has learned what the machine type looks like from previous series. The recognition software could then set a value on each of the new 100 machines. Say from 0 to 100%. This value would indicate how well it was recognized as the machine type. The idea is then to match machines with a low recognition value but with a high performance value. These two pieces of information could then indicate new information. A beginning of a new set. Another idea would be that you keep those machines that show an interesting feature but perhaps have a lower performance value than what you would normally find acceptable. To let it develop to something better later on. The idea is simple. The problem with many images is that there are way to many files. Then why not put them in a slow moving video. Said and done. You need the software ffmpeg or similar for this to work. Could be good for sending many photos in an email. The compression with h.265 is excellent. I just compressed 1321 photos to 41MB. Though at lower resolution. 800×600 pixels. Another good thing is the transfer speed from a slow HDD is much faster. Sending a single file is much faster than transfering 1000+ different files. To extract a single image. Just take a screenshot with the videoplayer or some other software. I started out thinking about determinism. Its pretty good because its kind of true and kind of not true. Then I thought. What about evolution. If freewill exists. Then it has to be evolved. This much must be true. However I wrote in small blog post that ”evolution is just another kind of set generation”. By this I guessed that new species are new sets. Members of different species belong to different sets. Something like that. If I then start with something small. An example of a set generation would be evolving bacteria. Bacteria or at least some of them are predictable until they mutate and evolve. It has found a way to survive or one can say that it has found new useful information. I think this is the key. Information can follow an evolutionary path. It could be that we as persons are in the process of evolving information. But not necessarily successful or fast. So the freewill of a person could be his ability to generate new information. Information that has not come from that person before. Even if the information is predictable like being able to write. The information how to write was not there in him before he learned it. So to associate with the previous blog post about smart determinism. Smart determinism could be determinism that allows set generation. Cameras has batteries that don’t last that long. 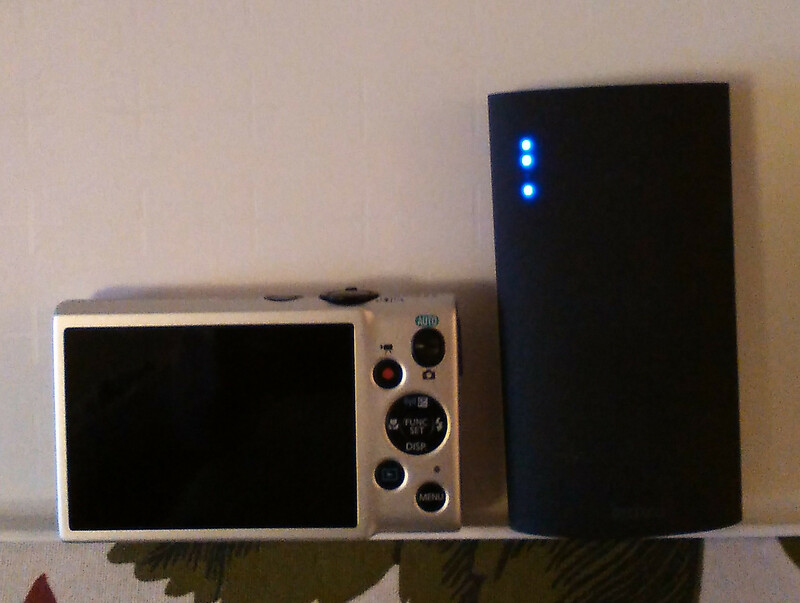 So why could not the camera be powered with an external powerbank battery? This little Canon camera has a 680mAh at 3.6V battery. It could easily be powered by a powerbank with 5000mAh worth of energy. With such a capability I would not need to keep the battery charged up before the trip and 5000/680 = 7 times longer videos could be recorded. Should there not exist digital compact cameras adapted for this? Idea – Digital Cameras And Powerbanks? Now this camera did not support this feature. Here is a speculation on a freewill system. Just some aspect of it. Even if the there is a physics engine system in the brain. There is a faster way to generate actions than to simulate them in a would be 3D world. That is to generate a brain action sentence. Like most actions I can think of. They can be described in a book. In single sentence of words or more. Then one way to generate the next action is to predict it by the input of the previous action sentences. This would be the brain action sentence system. The procedure of predicting a plausible action sentences should be quite fast. Like generating a manuscript for a personal biography movie. Another system would be the will prediction system. If you describe the will in a sequence of different wills. You could similarly predict the next will. If the action sequence with the new predicted value is transformed to a feeling. Or some other common format. Then it could be compared with a similar transformation of the will sequence with the new predicted will. The idea is then that if the feelings from all the transformed systems are equal. They coincide. Then the will is set to the new will and the action is performed. If they are not equal. The brain sentence prediction is regenerated with the error as the latest input. Because the will prediction is probably less likely to be wrong. So basically the idea is that all systems in the brain predicts what they are going to be next. Then the idea is that these predictions are transformed to the same format and compared. If the comparison is successful the action is performed. Here is my idea. Inspired by linear systems of equations and their different cases. Be it quadratic, under determined or over determined. I wonder what type of system the universe could be similar to. If you have an over determined system. You get situations where 1=3 and so on. You only have solutions in rare cases. It could be that the old deterministic idea is true. Like a quadratic system. One solution for every state. My problem with a quadratic system is that it pretty fixed. It does not permit much flexibility. Ones the universe is set in motion it can’t be changed. On the other hand if you have a subsystem together with a quadratic system which is under determined. A system which has more unknowns than equations. You could a parameter solution or infinitively many solutions in this subsystem. For instance the parameter solution to the equation y – 2x = 1 is y = 2t +1 for x = t and t being the parameter. If such an under determined system could be made predictable then my choice would be this system. Then how do you get a predictable value from those types of solutions? One thing you can say is that you can select values that are not really good. They seem unlikely. For instance the numbers are too big or they are too small. To fix this then you can say that the numbers the universe produced were typical of our universe. They seem to fit in. They were probable. Then the system would not be under determined anymore. But quadratic with some flexibility. Here is where I speculate the existence of Smart Determinism. The universe could be like an under determined system made quadratic with the help of third type of equations. It should behave and look naturalistic. In that there exists the possibility to change things a little so that things like freewill can exist. Still it would behave naturalistic. 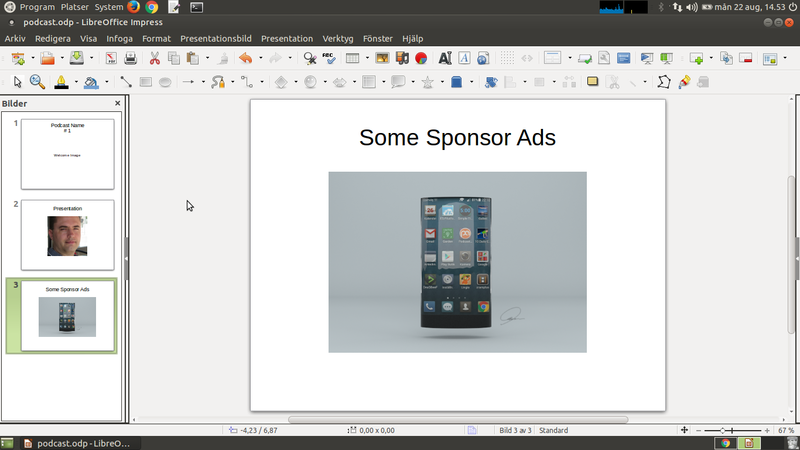 I was going to do a blog post pitching the idea of using LibreOffice Impress or Powerpoint for podcasts with images. Basically your podcast as background audio with a bunch of still photos. But hey. It looked way out of touch with technology we have had since 1998 with 3Dfx cards. So here is my idea. Make Impress more impressive with OpenGL and accelerated 3D graphics. With the option to export the presentation to video (h.264) you could then use it for podcasts, blogs and more. I like to make guesses and speculation so here goes. If particle teleportation exists. Then why not teleportation in both directions. Like a swap. With bidirectional teleportation of entangled particles I think they could solve the opposite value problem. Here two entangled particles A and B change position with each other at a high frequency. The swapping frequency should be high since this would make target positions easy to find. Just small changes from the previous position at each swap. So one solution to the value problem could be that in the time A gets a measurement it actually acts on both particles being present. The other particle is teleported away to the other position with the opposite value. If this does not work. Maybe the high frequency swap can be replaced by a random high frequency teleportation bounce. Here particles bounce on each others position randomly. That is. A goes to B and back and B goes to A and back. This then happens at a high frequency since both particles need to know the others position with a good precision. I have written before that you can use a smartphone for recording your own educational videos. Be it theory presentations, exercises, assignments or tests. If you are doing a course or are planning on educating yourself I really suggest you start recording. The process of recording video is a very good motivator. You want it to look good enough or as perfect as you can. This means you will redo the presentation several times. This process then makes you learn from looking, writing and speech. Maybe in the future you can communicate with teachers in this way. From exchanging videos. Say you want to get into this particular school. Maybe a portfolio of videos could help. In refugee situations maybe the student can create a weeks amount of videos on the smartphone. Then when Internet access is available they could be uploaded to a university for grading and feedback. Using youtube reduce the size of the video on the smartphone. I got it down to 30MB for 6 min HD video. Using handbrake and the h.265 encoder (software) on Linux I reduced a similar youtube compressed video at 17.1MB to 3.5 MB for 3:22 minutes. So about 1MB per minute. However this h.265 video were not viewable in the browser. However VLC (stand alone video viewer) worked fine. HandBrake settings. Using h.265 just for testing purposes. If you think of a singularity as a problem. Then because its a problem you have different possible methods for handling it. In general the most frequent way to solve a problem is to solve it by replacing it with a solution. But what if a solution does not exist. 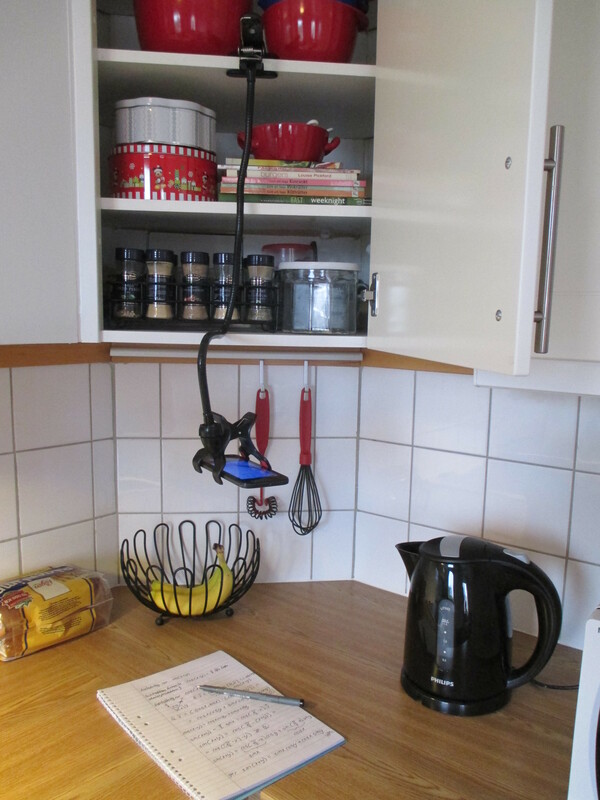 Then one way would be to mitigate the problem. To avoid it. Then the mitigating method would be the solution. The idea is simple in theory but I don’t know in reality. However the potential is good. The idea is to stream games from Internet Servers to the TV with the mobile as a go between. You buy the streaming ready game on the android phone and use it to stream it to any TV you like. Provided it has a chromecast or the like. Even if a game requires 8GB of RAM. Streaming should not take anything like such requirements. The limiting factor should be if you have enough bandwidth and latency for the resolution. For online Linux courses or MOOC’s I wonder if you can take advantage of screencasting software to make the training more effective and fun. For training purposes I suggest that there should be projects which include the student making their own screencasts of selected assignments. With enough guidance like a manuscript which has some blank fields they could fill in. They could create this video screencast and explain some related topics in it. It doesn’t need to be screencasts. With a simple smartphone and a flexible holder you could start to record selected topics from mathematics, physics and so on. I belive you learn a lot with this method. So why not take your math book and make a collection of videos. The idea is simple and could be a huge success. Why are the dumb phones not fitted with WiFi. It does not have be that fast however you should be able to make voice calls over the Internet with it. With WiFi also on the dumb phone. People who would benefit the most. People who don’t have that much money could use this below 20$ dumbphone for calls to their relatives in other countries. I’ve seen feature phones with WiFi but they cost as much as smartphones. The biggest impact should be if you fit dumbphones with WiFi. I think its a right to be able to stay in touch and up to date with your family. Also Internet access needs a Internet ready device. Then Wi-Fi on the dumbphone makes a lot of sense. The idea is simple. Or at least I think this idea could make a difference. If we want people to use their phone for perhaps reading and improving their skills in mathematics for instance. Then the release format for the Open Source Textbooks need to be more mobile friendly. One way this could be done is if the Open Source Textbooks are released in an adaptable screen size HTML version. Besides residing on the web you can convert these HTML books to apps using some web to app software. Then they would become accessible offline. Since a lot of books would still be in PDF version. I wonder if the PDF reader could adapt and render the text to fit the mobile screen. One way this could work is if the software recognizes the text area of interest after pressing on the text and reshapes it to be mobile friendly for zooming. The difference is that you would only need to scroll up and down. Not also sideways which makes the experience not very pleasant. How do you compress random data? My idea is that you don’t compress. You can recognize parts of the image that is looking random and replace it with similar random data but from a random number generator. This will however hopefully reduce the storage size. It will be a lossy compression. But since its still looks like random you will not be able to tell the difference. Maybe one can call it random image blindness. That is. If you percive an equal quality between a sampled part and the generated part you are blind to the difference. The idea is simple. Beliefs and feelings are in general are not just for show. The brain most certainly evolved to take advantage of these abilities. Thats the guess anyway. Then I can say that my guess is that the belief is the ”feeling version” of rational truth assessment.